Watch your rhythm! A surprising number of people will unconsciously play minims as crochets, or more commonly crotchets as quavers, and I know that even I do things like this occasionally! My jobs is to point out where students are playing the wrong rhythm and encourage them to count and not guess where the beats are! A good sense of rhythm is so key to playing any instrument – I often tell my pupils that I’d rather they played the correct rhythm and missed a few notes than paused and played the right notes! It is often a good idea to take some time out to work on rhythms – clapping rhythms at sight or saying rhythm names like ‘ta’ and ‘te-te’ or ‘tea’ and ‘coffee’ really helps. Use more bow on long notes: a lot of beginner students, and some more advanced ones, tend to use tiny bows for everything, especially long notes, producing a sound I like to called ‘mousy’. In order to encourage them to use more bow and produce a bigger sound, I tell them to try and use the whole bow, from the grip to almost the point, and I often put stickers on the bow (marking just above the grip, the middle and just below the tip) so that there is a visual aid for them, as some find it hard to tell. For more advanced students, practising scales and exercises with whole bows is key – just getting them to learn what the movement of their hand and arm feels like when they use the whole bow is sometimes new to them (see below). 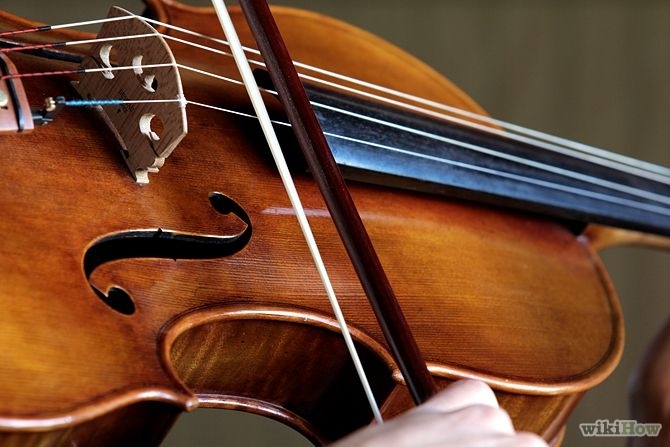 Make sure your bow is parallel with the bridge right to the tip – this is an extremely common fault, especially in viola players where the instrument is large and the bow is long. Bowing at an angle, either with the bow angled towards or away from the bridge, will cause the sound to become uneven and break, and the player will experience difficulty at the tip and frog. Sometimes guiding the student’s hand all the way through the bow, or placing your bow to form a ‘guide’ across the strings while they bow will help, though a lot of the time the student will go back to old habits when they play their pieces. Practising open strings and easy scales in a mirror to check the bow is straight will help, but if bowing crooked becomes a habit then it is more difficult to correct, so teachers should be vigilant when beginners first start to use the bow. Use less bow on short, fast notes – it is so common for students to come to me with difficult fast passages complaining of not being able to play them, when they are using far too much bow. One of my favourite mantras at the moment is ‘Keep Calm and Use Less Bow’ – one student said I should get a mug with this on it! Generally, the faster the passage and the shorter the notes in it, the less bow you need – for really fast semiquavers, I only use about a centimetre or less. This is a revelation for most people and can easily transform a messy passage (think Vivaldi Concerto in A minor for example) into something much more neat and controlled. Observe ALL the markings in the music – bowings, slurs, articulation, tempo but ESPECIALLY key signatures! I can’t stress how important this is for anyone learning a musical instrument. I often have students who will ‘bulldoze’ their way through a piece ignoring accidentals, bowings, slurrings and sometimes not even playing all the notes! Cue me pointing out all the things they have missed and the student listening with glazed eyes… Attention to detail is really important in music, as the difference between F sharp and F natural in a key signature of D major is fundamental to the music, but may be easily missed if the key signature is ignored. Understanding key signatures is difficult but an essential piece of theory that no musician can be without, so starting early with the concept of keys and sharps/flats is sensible. This entry was posted in Articles and comment, Teaching, viola playing and tagged bowhold, bowing tips, common teaching issues, key signatures, posture, rhythm training, schools, teaching, violin/viola teaching on May 7, 2015 by jesswyatt. We all know the old adage ‘practice makes perfect’, and as a professional musician myself, I know from experience that this is all too true. Behind every polished performance are hours and hours of dedicated rehearsal, practice, memorisation and close analysis of problems and their solutions. What not everyone knows, however, is how to practise so that the time spent practising is spent in the best possible way; in other words, how to achieve the most in the limited amount of time that is allotted to practising. Many children, and adult learners for that matter, have not been told the fundamentals of how to practise a piece in order to correct the mistakes that their teacher points out to them. How to practise is part of the fundamental toolkit of every musician, which includes basics such as how to tune your instrument, how to hold it correctly and make the best sound from it, and how to improve your own playing. As a teacher, I don’t like to spoon-feed my pupils – I like to try and challenge them with questions about what they are playing, why, what this means and so on. But I had sort of assumed – and this was a dangerous assumption – that most children know how to practise in such a way that they can improve and see their own improvement. I now know that I should be telling all my pupils the basics of how to practise a piece, and not just assume that this is obvious – as to an adult, practising the difficult bits of a piece more than the easier bits is common sense. In my experience as a teacher, children tend to play their pieces through from beginning to end, often as fast as possible, and it doesn’t really occur to them that this might not be the most effective way of practising them. What often happens is that the same mistakes get repeated every time they play the piece through, and as such become ‘part’ of the piece and the way they play it, making it even more difficult for the teacher to correct when the mistake is pointed out. These habitual mistakes can be addressed, but what is much more effective is pointing out that playing the more difficult bars or sections of a piece on their own repeatedly until they became easier, then fitting them back into the piece, is a much better way of approaching the difficulties of a piece. Of course the piece must be played through from time to time to prepare it for performance, but variety is important – many teachers have emphasised to me the importance of not always starting at the beginning of a piece. Unfortunately, there are no shortcuts to learning a musical instrument, but if this kind of mindful practice can be learnt and applied, then it will make the process of learning to play music more rewarding and less frustrating for the pupil. In other words, it is the quality, not the quantity, of practice that really matters! This entry was posted in Articles and comment, Classical Music, philosophy of practice, Teaching and tagged How to practise, learning to play an instrument, Mindful practice, practice makes perfect, violin/viola teaching on May 15, 2013 by jesswyatt. Inspired by all the questions I usually get asked about playing the viola, I’ve decided to write answers to the more frequently asked questions. This post has turned into a longer one than I expected, so I’ll be impressed if you make it through it all. Hopefully you’ll learn something new about the viola though! What is a viola? What is the difference between a violin and a viola? A viola is often described as a ‘big violin’, which is a pretty accurate, if rough, description. A viola is larger than a violin in all dimensions – it is longer, deeper and a little chunkier, but the most significant difference between a violin and a viola is that the viola’s sound is lower in pitch (a fifth lower, to be precise) than the violin, and its tone is richer, rounder and mellower compared to the violin’s brilliant, flashy sound. The viola shares its 3 highest strings with the violin, but has one string a fifth lower, so instead of the violin’s E-A-D-G strings, its strings are A-D-G-C. The viola is the second highest instrument in the violin family, coming in pitch between the violin and cello, and the viola is the middle section in an orchestra. How do you read the alto clef? Why is the viola sometimes called the ‘Cinderella’ of the orchestra? The viola has been under-represented as a solo instrument and unfairly maligned as an orchestral instrument (see below), leading to some calling it the ‘cinderella’ of the orchestra. In recent times, beginning with pioneers such as William Primrose and Lionel Tertis (who wrote books called ‘My Viola’ and I and ‘Cinderella No More’), the viola has risen to prominence as a solo instrument in its own right, with more and more works being composed for it. The viola repertoire is relatively small compared with many instruments, but given that the instrument took a long time to be recognised as a solo instrument, many major works have been written for it such as the famous Walton and Bartok Viola Concertos, and works by Britten, Vaughan Williams, Hindemith, Shostakovich, Clarke, York Bowen, Penderecki and Schnittke. Aren’t viola players just failed violinists? Absolutely not! Contrary to popular belief, playing the viola is actually harder than playing the violin. It is a larger and heavier instrument to hold, requires a more robust bow arm as the strings are slightly thicker and require more effort to make vibrate (especially the C string), and the notes are further apart than on the violin, making it harder to stretch some notes. Overall, it is harder to make a good sound on the viola than it is on the violin because of its larger size, but the sound when it comes out is gorgeously rich and full. I find that when I switch to violin (mainly only for teaching purposes, as I am definitely a true violist at heart!) everything seems very easy and so small, like playing a toy version of my viola! I’ve never heard of any famous viola players. Most people if you asked them probably would not be able to name any famous viola players, but if you do your homework you’ll find that many of the most famous composers including Mozart, Bach, Haydn and Beethoven played the viola and composed music for it, if only in combination with other instruments – Mozart is said to have directed the first performance of his Sinfonia Concertante from the viola. Other composers who were viola players include Britten, Frank Bridge, Schubert, Dvorak, Rebecca Clarke and Paul Hindemith, suggesting that as a composer, the viola was a popular choice, perhaps because of its role as a harmony instrument. Many famous violinists also play (or played) the viola, such as Nigel Kennedy, Maxim Vengerov, David Oistrakh, Yehudi Menuhin and even Paganini, so it was not nearly as neglected an instrument as most people think! The pioneers of the viola as a solo instrument included the British violists Lionel Tertis and William Primrose, and notable viola virtuosos of today include Lawrence Power, Yuri Bashmet, Nobuko Imai and Jane Atkins. Why would you choose to play the viola and not the violin? Isn’t it boring not playing the tune? As mentioned before, the viola is harder to play than the violin, making it more of a technical challenge. People will often tell you that playing the viola part is ‘easy’, or easier than the first violin part, which is true to an extent as first violin parts are often stratospherically high, but there are different challenges in viola parts such as playing fast on thicker strings. I personally find it very satisfying to be in the middle of the texture, both in orchestras and in chamber music, underpinning the harmony – I don’t mind not playing the tune all the time! Having said that, many composers give the viola section really great bits of tune, which conductors often refer to as ‘viola moments’! Why are there so many viola jokes? Q: Why would a viola player constantly go to his locker five times a day? There are hundreds, if not thousands, of viola jokes. They all draw ammunition from the assertion that violists are failed violinists (see above), so we are credited with various characteristics in the jokes: not knowing how to hold our instruments (above), playing timidly (eg How do you get a viola-player to play pp tremolo?’ – ‘Write solo in big letters over the part’), so old that we are dead (eg What’s the difference between a viola and a coffin? The coffin has the dead person on the inside) and just plain incompetent (eg How can you tell when a violist is playing out of tune? The bow is moving). All I have to say is for all of these jokes, try replacing the word ‘viola’ with another instrument – the joke will work just as well with practically any other instrument. Viola players (for the most part) tend to be friendly, approachable and long suffering – perhaps because we have been maligned for so long! See this article for a good description of the viola, viola players and a mention of viola jokes. Why do violas come in many sizes? Unlike with violins, cellos and double basses, there is no such thing as a ‘full size viola’. Violas can range in size from just larger than a violin (which has a body length of 14 inches) to massive violas with body lengths of 17 to 18 inches. Most viola players will choose an instrument in the range of 15-16.5 inches, as these are the instruments that are comfortable to play in size and produce a good resonant tone; the smaller the instrument, the smaller the sound, especially on the C string. The size of your viola is a personal choice based on what size is comfortable for you relative to the sound of the viola. I have played violas ranging from 15 to 16 and a quarter inches, and my current one is 15 and 3/8 inches – relatively small, but it produces a nice resonant sound as it is quite generously proportioned widthways. Does anyone start playing on the viola? Why does it seem like most viola players start on the violin? People can and do start playing on the viola itself, but due to its larger size, most small children who start playing will start on the violin and then move to the viola when their hands and arms are big enough. Having said this, you can use a small violin strung as a viola (but this really does not sound good, especially on the C string), and there are now violin-viola conversions available, which help small violins sound more resonant like violas. These are a bit drastic, as a small hole is drilled through the front of the violin and the bridge is placed in direct contact with the soundpost, but they do sound better than a simple violin strung as a viola. I cannot emphasise enough that this should never be attempted at home or with a violin other than a cheap factory made one. Can you play fiddle tunes on the viola? Yes, definitely! Fiddle tunes transposed down a string work well on the viola, especially slow airs, as they suit the mellow tone of the instrument. The viola can also be used very effectively to accompany fiddlers using drones and chords. This entry was posted in Articles and comment, Classical Music, viola playing and tagged Life as a viola player, Viola as a solo instrument, Viola FAQs, Viola jokes, Viola playing, violin/viola teaching on May 1, 2013 by jesswyatt. I’ve started my new job and it’s going well – I am learning a lot about obesity and literature searching, and I have discovered the joys of Endnote and never having to write out a reference again! Academics and essay writers take note: Endnote or a similar referencing manager (there are free ones) will save you literally hours of tedious referencing and bibliography writing. (I sound like they are paying me to advertise them, which they are not!) Anyway, I think I will really enjoy my work at the medical school, even though it is quite weird being a ‘staff’ member where I used to be a student (I’m now in a different dept though, so not as weird). I will start going to the baroque orchestra at the St Andrews Music Centre, run by my good friend and amazing cellist Claire Garabedian; I think I will get to borrow a baroque bow which will be fun! I have two lunchtime concerts coming up in February and March, both with experienced pianist Audrey Innes who I have played many a concert with! For both concerts, we are playing a programme consisting of Hindemith viola sonata Op 11 No 4 which is very romantic and fantastical as well as being incredibly dramatic and a huge piece to play, combined with a short piece by Frank Bridge (also a viola player) and Schumann’s Adagio and Allegro (originally a horn piece), a real gem of a piece. The concert in St Andrews is Weds Feb 27th at 1.10pm in the Younger Hall (note 5 mins earlier start time), and the concert in Dundee is on Friday 8th March at 1.20pm in the University Chaplaincy. Along with a friend, we are trying to organise concerts in St Andrews and at a stately home near Broughty Ferry of Haydn’s Seven Last Words for string quartet, to coincide with Lent. Hopefully we can confirm these soon. Of course, I’ll continue with my teaching. I’ve got a new pupil (an adult learner interested in fiddle) starting on friday! This entry was posted in Arts, Classical Music, Concerts, gigs, St Andrews Music, viola playing and tagged Bridge, cats, Chamber music, concerts, Hindemith, Lunchtime Concert, organising concerts, Schumann, St Andrews, St Andrews music scene, Viola music, Viola recital, violin/viola teaching on January 22, 2013 by jesswyatt. The image is the f hole from my viola, lightened slightly so that the text stands out. I think they look quite good (and so they should, they amount they cost!) I used the website goodprint as they let you upload your own background, after investigating other websites such as moo and vistaprint and finding that I couldn’t do it on those sites (maybe that was just me though…) I feel a bit silly for not putting this blog address on too though, meh. Oh well, now all I’ve got to do is find people to give them to! 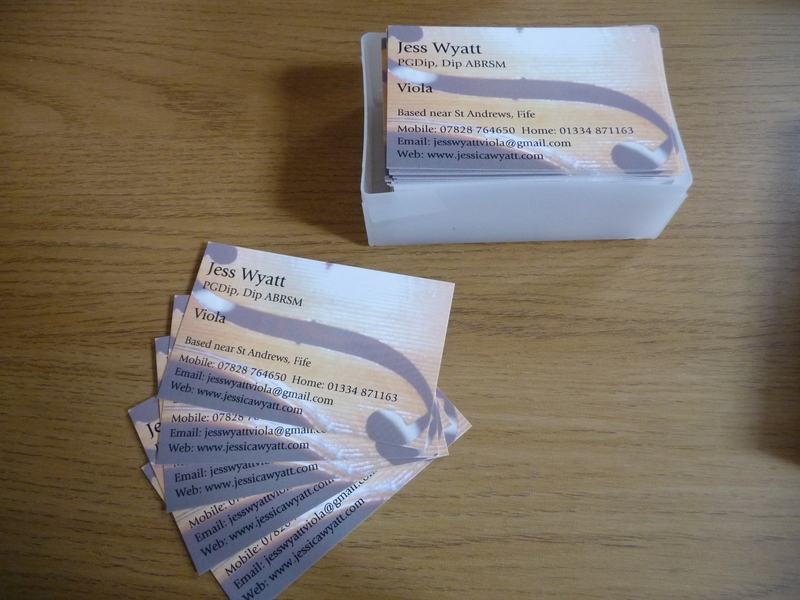 This entry was posted in Promotion, viola playing and tagged Business cards, publicity, violin/viola teaching on April 4, 2012 by jesswyatt. All material posted here is copyright Jessica Wyatt 2010-2015. Please contact me through the links at the top if you wish to use any material or quote my posts. Thank you. Teaching studio now open again! Add me on Linked In! I'm a viola player living in Scotland who likes to write about music, the arts, education, creativity and occasionally other things that take my fancy. I like Bach, cats, photography, Stephen Fry, playing chamber music and walks on the beach. Please feel free to contact me if you have any enquiries about booking a viola player or violin or viola teaching in central Scotland. My website is www.jessicawyatt.com and my email address is jesswyattviola(at)gmail.com. "... these are a few of my favourite things"
Express yourself. It is later than you think.